Home Network Camera. H.264/MPEG-4/MJPEG dual streaming. Two way audio. The feature packed yet discreet BL-C210â"™s Power Over Ethernet and UPnP features give access to easy set up in more areas than before and with less time required to get started viewing bandwidth saving H.264 video files over the internet. This professional and easy to use camera offers value for money surveillance for you and your property. The BL-C210â"™s IP compatibility make observed areas visible via the internet from any destination. Even when you arenâ"™t connected to the internet the BL-C210â"™s infra-red detection sensors mean that any movement or detectable noise that is above a set threshold will be registered by the camera and an image sent directly to your phone or laptop. The C210â"™s pan & tilt capabilities mean more areas can be covered, thus reducing the need for additional cameras. The scope of the surveillance can be increased further with the one way mic which can be used to listen in on the area the camera is positioned. Even if the cameraâ"™s features need altering this camera comes with two external input ports so extra sensors and switches can be connected. Save Your Worries with Remote Monitoring by Panasonic Home Network Camera Do you sometimes worry about things at home while youâ"™re at work or on vacation? 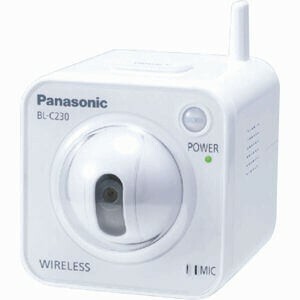 Panasonic network cameras let you monitor your room over the Internet from wherever you are. They even notify you by e-mail when they detect moving objects. And you can choose the video format to match the Internet connection and your viewing needs. Let Panasonic network cameras keep an eye on things - anytime, anywhere - so you can relax and enjoy yourself. The camera Ã•s built-in microphone collects peripheral noise and when camera detects the noise exceeding the threshold it stores the image captured. This is a newly added function. With privacy mode you can shut the camera lens and protect yourself from unwanted exposure. Operation is simple - you only need to push the privacy button. When the subject darkens, the camera automatically adjusts the brightness to show you the image. You can see clear, easy-to-view images even in the dark. *1 The image tends to blur more than that in standard mode when viewing a moving subject in low light. When viewing a dark subject in Colour night view mode, spots of white or Coloured light may appear in the image. Some subjects may require additional time for focusing with the auto focus function. The monitoring image is easier to see because it fills the entire screen. The included Power Transfer Unit supplies the camera the power through the LAN cable. It allows you to install the camera anywhere , like on the ceiling where no power outlet is.